PHOENIX, AZ--(Marketwired - Jan 14, 2014) - Singlepoint, Inc. (OTC: SING), a state-of-the-art mobile technology company and full-service mobile marketing company, announces an increase in incoming sales calls as a result of an innovative TV spot contracted for The Golf Channel by Singlepoint's client, GolfLogix, Inc.
GolfLogix, in the business of course-mapping since 1999, is now the #1 smartphone app for golfers and boasts more than 2 million members using the world's most popular smartphones. As previously announced, Singlepoint's mobile payment technology serves as the platform of choice for GolfLogix smartphone app sign-ups and memberships. 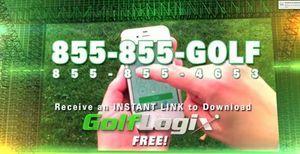 Greg Lambrecht, CEO of Singlepoint, Inc., states, "The GolfLogix TV spot began running last Thursday, and our phones have been ringing with customer inquiries and membership upgrades." He continues, "We're now at in excess of $1,000,000 in revenues and growing, and the recent push in marketing by GolfLogix for their app continues to add to our bottom line and overall revenue potential. It's a great way to kick off what I feel will be a big year for the Company and its shareholders." New market research published in November 2013 by Allied Market Research indicates that the global wallet market is expected to reach $5,250 billion in 2020, growing at a CAGR of 127.5% from 2013 to 2020. Singlepoint execs are confident that applications and usage of its mobile commerce technology, including mobile payments, donations, auctions and more, will grow alongside the industry as more and more people increasingly utilize their smartphones for everyday tasks. Easily downloaded for free from www.GolfLogix.com or stores such as iTunes and Android Marketplace, the GolfLogix GPS app provides accurate distances to the center of the green, yardage book quality imagery of each hole, scorekeeping and in-round pro-level stat tracking for more than 32,000 courses worldwide. For less than $20, an upgraded annual Champion membership provides golfers with club tracking and distances to any location on the hole -- including pin position, hazards and landing zones. The #1 Golf App, GolfLogix boasts more than 2 million members on the world's top-selling smartphones. Dedicated to offering consumers the most advanced GPS solutions with the best features, quality and price, GolfLogix helps improve individual performance. Strategic partnerships with industry-leading content provider Golf Digest, top retailer Golfsmith and tee-time reservation service GolfNow present members with exclusive benefits directly through the app. Founded in May 1999, GolfLogix was the first to introduce handheld GPS to the golf industry and holds a U.S. patent for its unique GPS and Internet-based club tracking application. Based in Scottsdale, AZ, the company has been professionally mapping courses for more than 12 years and owns the largest, most up-to-date golf course database in the world. In 2009, the rapid advance of smartphone technology led GolfLogix to develop and quickly capture the market with an easy-to-use application providing precise GPS distances. In addition, the software manages scorekeeping and stat tracking, then uploads them to an online clubhouse community where golfers can interact and compete with millions of other players worldwide. For more information: www.GolfLogix.com, 877.977.0162. About this company Singlepoint, Inc.
Screenshot from The World's #1 App for Golfers, GolfLogix, currently running on The Golf Channel.